The makers of the movie URI have been treating with videos from the films sharing glimpses of the surgical strike which have gone ahead creating rage amongst rage audience. 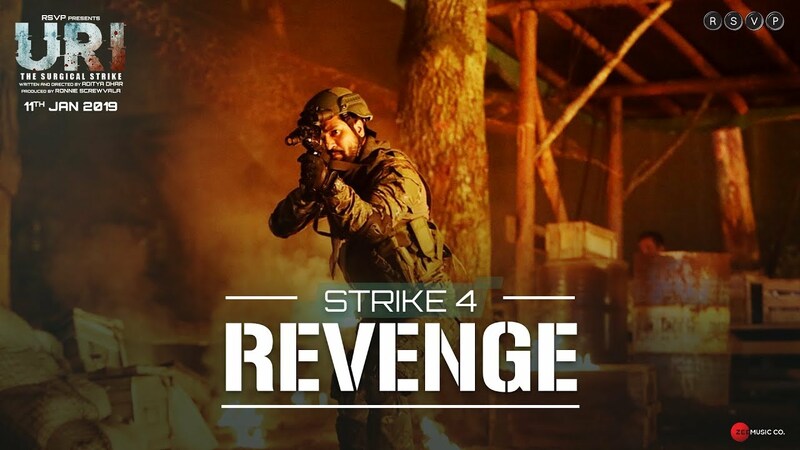 They have released yet another video titled “URI | Strike 4: Revenge”. The recently released video showcases Vicky Kaushal in an attacking fierce at the enemy’s land wherein the surgical strike is in progress wherein the fight isn’t just with the guns firing but Vicky fights with the enemy without the guns as well which gives goosebumps looking battlefield. Earlier videos showcased Yami Gautam make a striking announcement, wherein Yami Gautam along with Vicky Kaushal and men in uniform let everyone know that New Hindustan is intolerable. A few days ago, the makers had released the first song from the movie ‘Challa’ which will pump in energy and would awaken the patriot in you showcasing the hardships and the training the Indian soldiers go through as they guard our nation. Just like the trailer even the song manifests Vicky Kaushal’s journey of creating a whole team to conduct the surgical attack. The visuals of the song display an army officer (Vicky Ksuahal) leading a team to avenge the killings of his fellow comrades. We can also see Mohit Raina, Yami Gautam and Kirti Kulhari in few scenes.